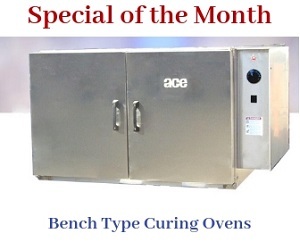 The ACE Burn Off oven model 3120-RT is capable of removing cured paints, oil, or grease from engines, and other metal parts. It is equipped with a secondary chamber or afterburner to achieve complete cleaning of parts. The primary burner of the model operates at 800°F (427°C), and the afterburner at 1,400°F (742°C). These high temperatures cause all volatile materials to decompose into smoke and gases. These harmful substances are carried to the afterburner, where they will get burned off completely. Hence, there are no poisonous and harmful fumes or gases released during the heat cleaning process. The 3120-RT model is exclusively designed to ensure safe and fast cleaning of parts with minimal operator attendance. This radiant tube oven model minimizes expensive and time consuming secondary cleanups. Normal cycle time of 3120-RT oven is 2 to 8 hours, and the combustible capacity is 50 LBS/HR. Oven Volume 140.00 CU. FT.